This vase is 11 inches high, 16 inches wide and 10 inches deep. It was created by artist Sandra Lercari by tack fusing a white glass lace on to a square transparent "true blue" piece of glass. This was then slumped over a stainless steel canister to create an organic multifold floral-like design. 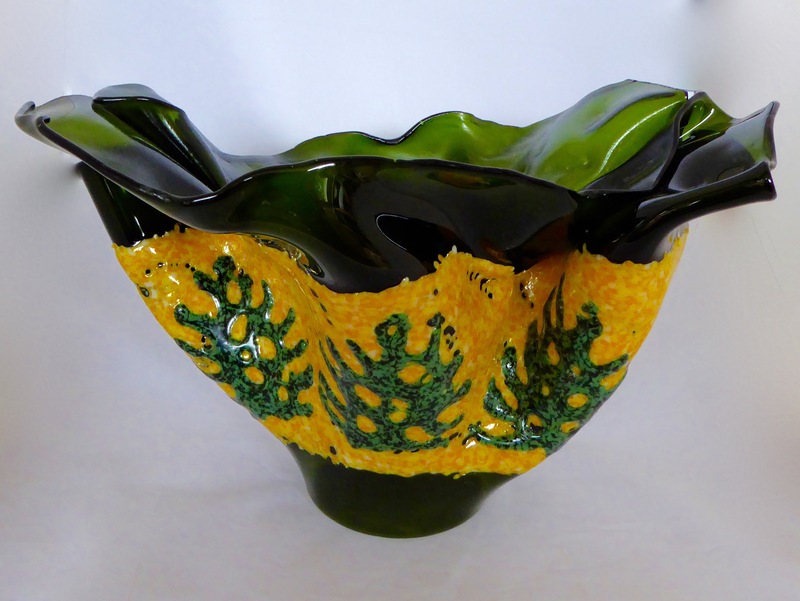 Vase was created by artist Bob Lercari using transparent fern green glass for the main body of the piece. 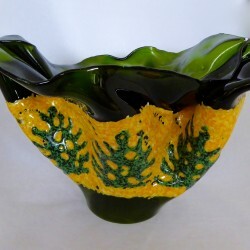 Glass frit was used to create an opaque band of marigold yellow with Hawaiian naholo leaves superimposed. The piece is 16 inches in width and 10 inches deep. Height is 10 inches. Piece was slumped over a stainless steel canister to create an organic multifold floral-like design. 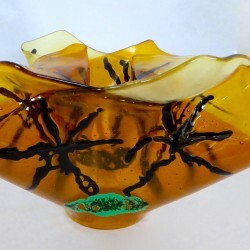 Vase was created by artist Bob Lercari using transparent amber glass for the main body of the piece. 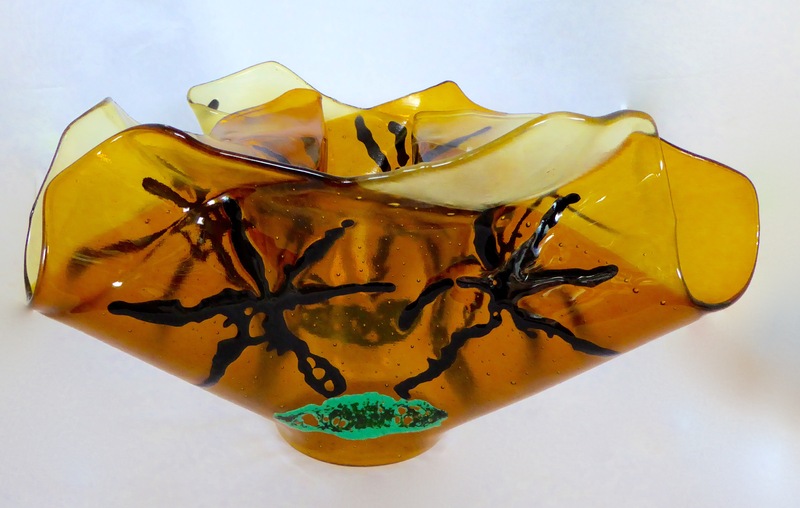 Glass frit was used to create opaque palm tree silhouettes fused to the amber base. The piece is 15 inches in width and 13 inches deep. Height is 9 inches. Piece was slumped over a stainless steel canister to create an organic multifold floral-like design. Vases are created by slumping large square or circular glass pieces to which designs of interest have been attached by either full fuse or tack fuse. The slumping is one over a stainless steel canister The resultant shape is dependent on the temperature to which the piece is subjected. See the September blog “Tacos and Caterpillars” which describes the process. Fused glass designs to frame mirrors are being developed for a variety of mirror sizes. 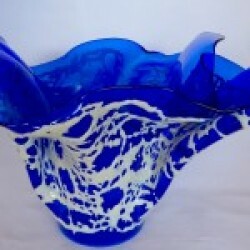 We are also developing fused glass designs for wall sconces and for table lamp shades. We had expected to present these on our website for some time now…but find ourselves too busy (glass-wise as well as family-wise)…but we are working on it. So, I’m now projecting summer of 2018. Thank you for your patience.